What will it take for UAB to become ranked? 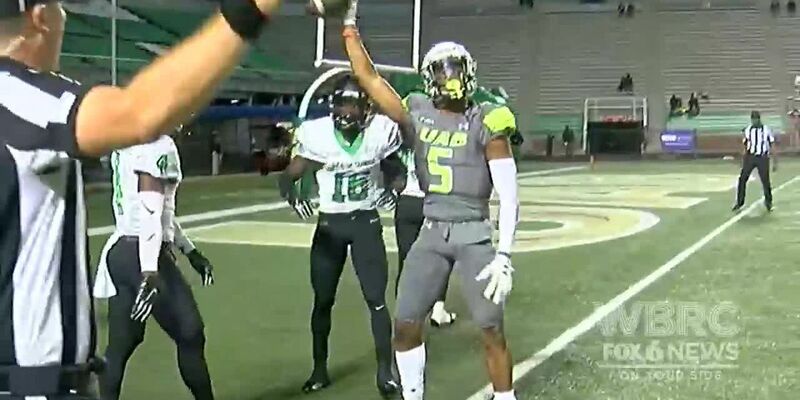 BIRMINGHAM, AL (WBRC) - UAB football has broken numerous records this season. The Blazers are 7-1 and off to their best start in program history. They’re currently on a program-best 6-game win streak, and with every win at Legion Field they’re extending their home winning streak, which currently sits at 10. With Saturday’s 19-0 win against UTEP, the Blazers also became the first C-USA team to post three shutouts in a season. But with UAB’s impressive 2018 season and it sitting atop C-USA, the question remains when the Blazers will become ranked. As of October 28, UAB is getting closer. The Blazers are receiving 17 votes in the AP Poll and 24 votes in the Coaches Poll. To add some insight, UAB is receiving more votes than Auburn in both polls. While it seems like UAB might be receiving its due, there are 10 teams in each the AP and Coaches polls with at least two losses. All 10 are Power 5 teams, but Houston, Utah State and Fresno State are all 7-1 and ranked over UAB. UAB has a major upcoming chance, however, to make noise nationally. If the Blazers can pull off a massive upset of Texas A&M on November 17, voters surely won’t be able to ignore UAB any longer. However, before the trip to College Station, the Blazers have back-to-back home games, hosting UTSA this weekend and Southern Miss next.